“The Light From Within” by Christian Faith Publishing author Nancy W. Kelley is an elegantly simple but profoundly moving book of short poems largely inspired by the unfortunate life events the author and her family have had lived through, suffering many losses and afflictions, all of which, through Kelley’s talented pen and paintbrush, achieve a hard-won wisdom and beauty encased in everyday scenes and internal musings. “The Light from Within”: a touching artistic book of poetic and spiritual musings. 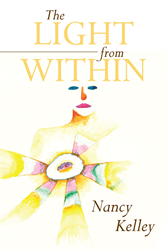 “The Light from Within” is the creation of published author Nancy W. Kelley, a fun-loving, adventurous spirit and mother of three daughters who uses her gifts in art and poetry to process life events and reach out to fellow hopefuls and faithful’s. Published by Christian Faith Publishing, Nancy W. Kelley’s new book is an insightful series of short poetic vignettes taken from all facets of the author’s life: pondering domestic cares, family and parenthood, friendship and strangers, American society, love and loss, grace, compassion, and God. Beautifully illustrated by the author, Kelley uses both her brush and her words to paint a compelling human portrait that moves through suffering, despair, wonder, joy, and hope. View a synopsis of “The Light from Within” on YouTube. Consumers can purchase “The Light from Within” at traditional brick & mortar bookstores, or online at Amazon.com, Apple iTunes store, or Barnes and Noble. For additional information or inquiries about “The Light from Within”, contact the Christian Faith Publishing media department at 866-554-0919.